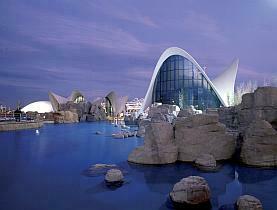 L'Oceanogràfic in Valencia invites us to travel around the planet's main seas and oceans. More than 45,000 examples of 500 different marine species - amongst which can be found sharks, Beluga whales, walruses, sea lions, penguins and manta rays - inhabit nine underwater towers that, structured in two levels, represent the most emblematic ecosystems of the planet. The Oceanogràfic Valencia aquarium park, created as a great leisure, training and research centre, is structured into ten great areas. The marine areas reflect the Mediterranean habitats, the polar oceans - the Arctic and the Antarctic, the islands, the tropical seas, the temperate seas and the Red Sea. Moreover, the facilities of this gigantic Valencia aquarium also include a spectacular dolphinarium, an auditorium - within which one can find the Red Sea aquarium - with an area for the mangrove swamps and another for the marshlands, and different garden areas, with more than 80 different plant species. And of course it also offers many different services such as shops and restaurants, amongst which should be highlighted the underwater restaurant where clients can have dinner surrounded by an immense aquarium. 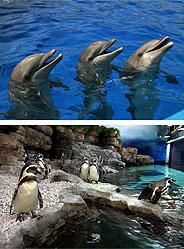 Now, with the Pasaporte Animalia, you can become a dolphin trainer for a day. This activity is available at weekends and includes an impressive visit to the dolphinarium of the Oceanogràfic Valencia and the technical area for the sea lions accompanied by the trainers, so you can see these friendly animals up close and find out how to look after them. For more information call 96 197 55 00 and for bookings call 902 100 031.